Whether you are Android users or iOS users before, you definitely don't want to lose all text messages or iMessages after switching to a new iPhone, so here I would like to introduce the best 2 ways to transfer SMS to new iPhone without iTunes or iCloud. This works for all iPhones including the latest iPhone XS/XS Max/XR. Every iOS users should be familiar with iTunes or iCloud, as they are widely used to restoreSMS messages to new iPhone. However, I am not going to use neither of them for some well-known reasons, like data overwritten, cannot selectively backup a certain type of files, iCloud storage limitation and more. Alternatively, I shall recommend a third-party iOS file transferring software Tenorshare Phone to Phone Transfer to export SMS from old iPhone to new iPhone XS/XS Max/XR. 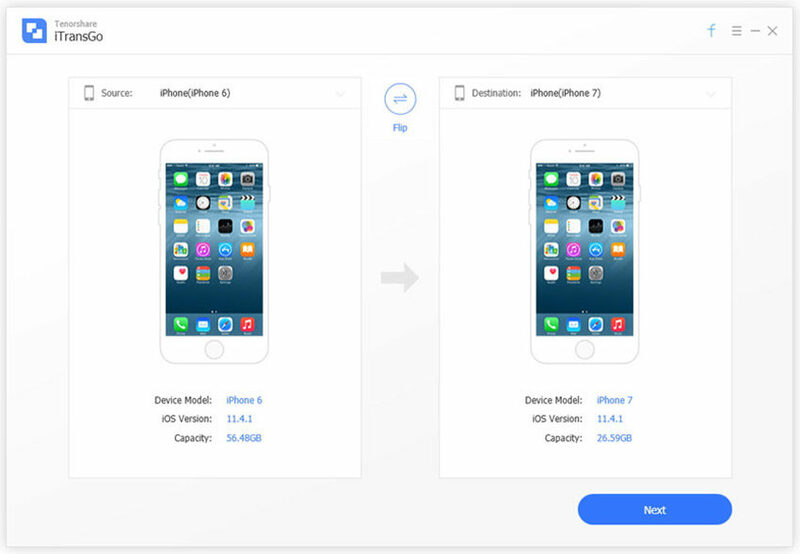 Your previous iOS device content and be directly extracted and migrated to new one without making a backup, and you can choose to transfer only text messages to new iPhone and not affect other existing data. Below step will simply walk you through the process to sync messages between iPhones. 1. Launch Tenorshare Phone to Phone Transfer and connect your source iPhone and destination iPhone in turn. When both are detected, click Next. 2. Check Messages or else from your old iPhone and Tenorshare Phone to Phone Transfer will automatically figure out the capacity usage needed for transferring. 3. Text Messages transferring will begin after clicking Start Transfer button. This process can take a minute or so to complete. There you've learned how to forward text messages from one iPhone to another. Incredibly fast and easy, isn't it? 1. Download Move to iOS app on your Android device and launch it. Agree the Terms and conditions when pop up. 2. Setup and activate your new iPhone X/8/8 Plus/7 and choose Move Data from Android on Apps & Data screen. Tap continue to acquire the 10-digit or 6-digit security code that used to connect your Android phones. 3. Go back to your Android device, enter the code and choose Messages to copy to your new iPhone. Wait for the process to finish and get start with your new iPhone now! That's all how to convert Android text messages to iPhone free. Depending on the messages size and network speed, the migrating time also varies for each device. After reading the post, you should now have no problem with transferring text messages to another iPhone, no matter from Android phones or iOS devices. Don't forget to share it to your families or friends if it's helpful.